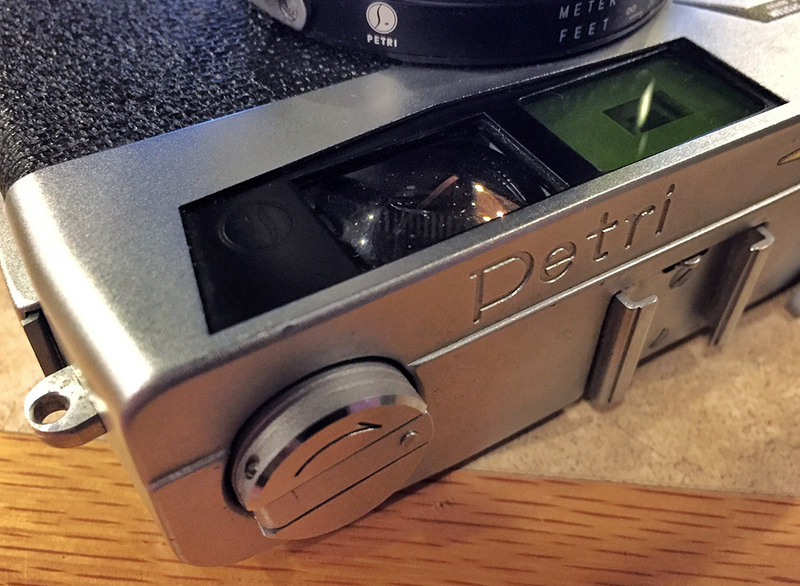 The Petri 7s was a long-running and affordable 35mm rangefinder, which sold well despite competing in a field jammed with options. This is not a Petri 7s. No, this is the original Petri 7 which, while it provided the basis for the improved 7s that did so well, wasn’t a big hit in its own right. 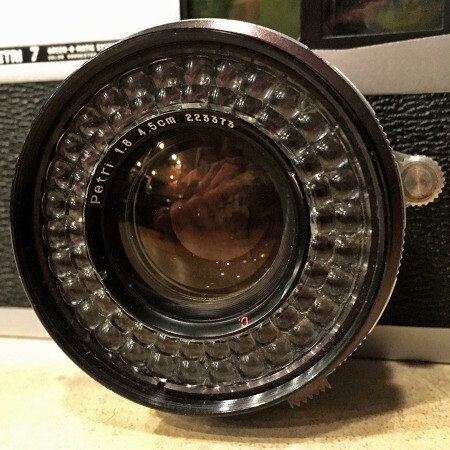 Built by Kuribayashi Shashin K&omacr;gy&omacr; (Kuribayashi Camera Industry), the Petri proved successful enough that the company (one of Japan’s oldest camera makers, having started in 1907) changed its name to Petri Camera Ltd. in 1962, just before the release of the Petri 7s that would achieve legendary status. But no, this is not a 7s. As I said, it’s just a plain old 7. It’s quite difficult to find anything useful about the original model online because the 7s is so pervasive. One thing is clear, though: it was only made from 1961 to 1964, as the 7s cannibalized its progenitor’s market share quickly after its 1963 release. The plain ol’ Petri 7 has nearly everything its later cousins has, though, including the “Green-O-Matic” rangefinder system and the “Circle-Eye System” light meter. The big differences are the film advance lever and the light meter display. 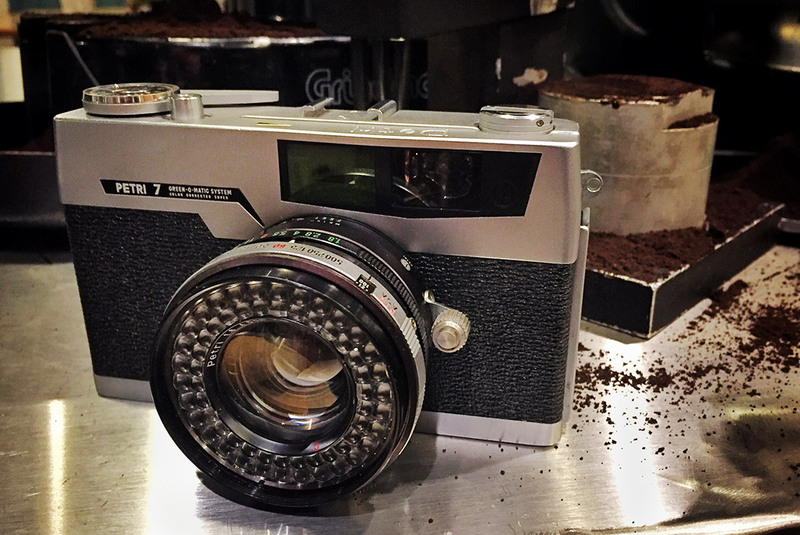 The advance lever on my 7 is on top of the camera, much like most competitors of the era, and has the frame counter on top. 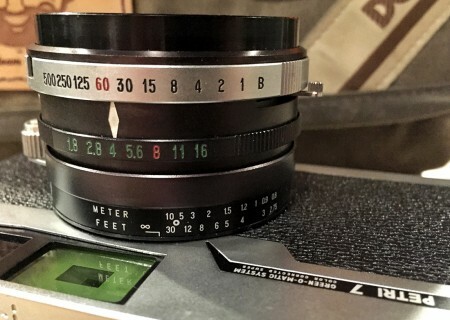 The light meter display is in the right-hand edge of the viewfinder and features a brilliant red needly in a lit field shaped a bit like a one-sided bowtie. On the 7s, the advance lever is beneath the top cover with a tab on the back of the camera; as it travels, the lever moves through a slot between the top cover and the camera body. 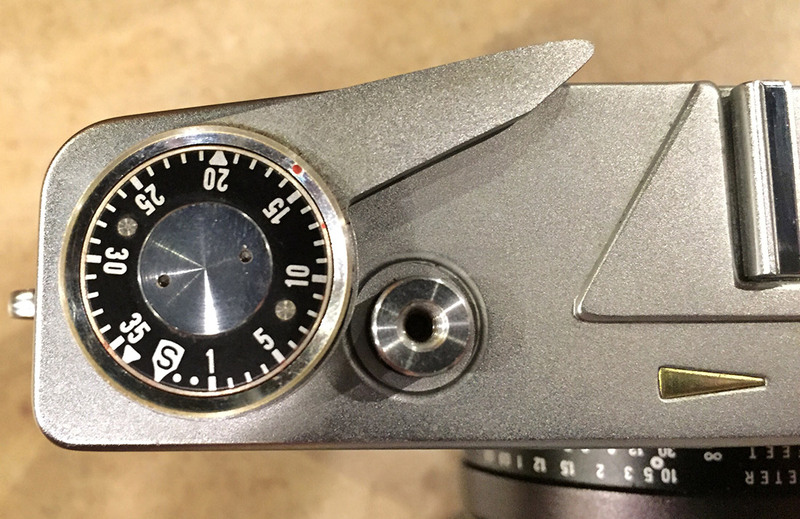 The light meter has a display on the top cover next to the shutter button. Well, probably — apparently some 7s variants lacked this external display. In both cases, though, the selenium light meter has a matrix surrounding the lens, inside the filter area, similar to the Olympus Trip or Konica EE-Matic. 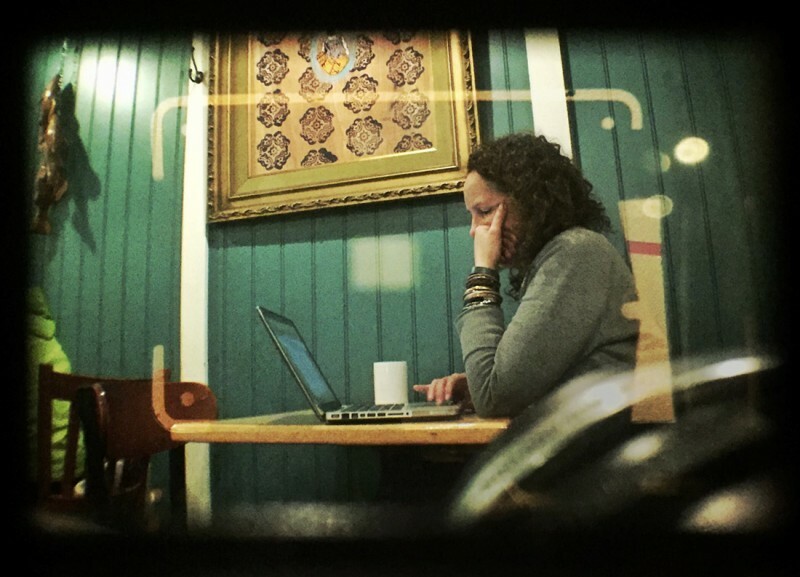 This is what Petri referred to as the “Circle-Eye System,” which not only improved reading accuracy, but also automatically compensated for filters since they affected the meter as well as the lens. The Green-O-Matic rangefinder is as simple as putting a plastic green filter over the rangefinder that gives the entire viewfinder a very slight green tint, which serves to greatly increase the contrast of the yellow focusing patch. You wouldn’t call the viewfinder in the Petri bright, and it’s not particularly big, but the focusing patch is very visible and easy to use. My Petri 7 came from a thrift store (do I even need to say that any more?) and when I bought it I didn’t really know what it was worth. I may have overpaid slightly compared to eBay prices, although I didn’t pay for any shipping and, cosmetically, this camera is in excellent condition. Here’s the thing, though — it didn’t quite work. It mostly worked, but not completely. It still might not work quite completely. The film advance worked fine but didn’t seem to want to return on its own, as if it suffered from some dried-up grease. The shutter was sluggish — even sticking — on most speeds. The aperture looked kind of teardrop-shaped — I realized when thinking about it on the way home that it must have a single blade sticking. A few carefully-placed drops of lighter fluid and a half hour of the old wind-snap-wind-snap-wind-snap routine and everything seems to be back in working order. The shutter speeds even seem pretty accurate. The only remaining problem is that the shutter still sticks open with the aperture at its widest — f/1.8. I found a forum thread that described the process of removing the lens assembly to access the aperture to fix a similar problem and decided it might not be worth my time, especially since there was likely to still be some lighter fluid in there working its way into things and freeing them up for who knows how long. I decided to go ahead and start testing anyway after I’d given the camera a bit of a cleaning. I did find that the black coating on the metal housing next to the internal element of the front lens group was starting to flake off, so I gently rubbed off the flaked bits and blew out the interior of the lens. I mention this because I noticed a lot of eBay listings for Petri rangefinders mention sand/grit/metal flakes/heavy dust in the lens, which may just be this coating flaking off and may simply require unscrewing the front lens group and blowing the lens interior out well. Initial thoughts: The Petri seems very well constructed, solid and even a little heavy for its size. The fit and finish are excellent and all the controls seem well-placed and comfortable, though the advance lever is very minimalistic and takes a little getting used to. I’m glad to have added this to my collection. 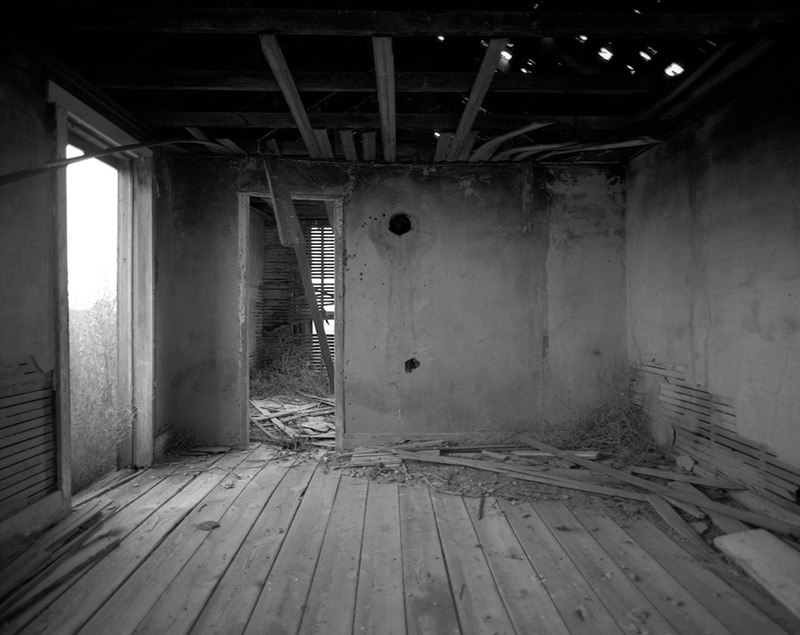 It was mostly cloudy and just short of sunset when I took this picture looking in the window of an abandoned house in the ghost town of Arlington, Colo. The grounds around it were full of weeds and held no evidence of any landscaping, porches, steps… The roof was probably 90% intact, but the shakes were badly curled and crumbling, clearly letting in plenty of snow and rain that disintegrated the plaster ceiling and swelled the lath until it began to come away from the nails that held it to the rafters, dangling under its own weight. I found it odd how much of the floor seemed clear of debris, although it’s possible that the plaster remains had been carried, a little each time it rained, through the gaps in the floorboards. It’s equally possible the plaster dust was simply carried away by the wind. The outside of the building was completely stripped of any paint it might have once had, as much by sun and wind as by rain and snow, I suspect. The unpaved streets of Arlington remain, although almost nothing of the town does. A small grid system, complete with street signs, sits empty on the plains of Eastern Colorado, slowly and inevitably returning to the prairie.